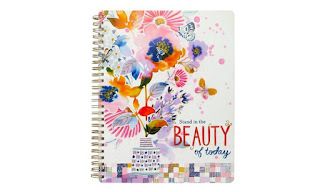 I have always love to find a design that is different, unique and not many people will have and with Capri Designs, I can find just that as they are about providing you with fun and fashion-forward stationery and gift designs with great prints that are vibrant and trend-right! Whether you’re back to college, decorating your home or office, or trying to maintain an organized life, we’ve worked to develop practical solutions with extraordinary designs for all of your stationery needs. From our Daily Journal, with back pocket, interior liners, and elastic closure, to our soft touch ballpoint pen, with a rubberized finish for an easy grip and smooth feel, we’re committed to adding an ‘extra’ touch to all of our products to provide you with a premium in stationery designs. I was sent a variety of products to review and they are Josephine Kimberling Note Card Set Dream Catcher features a decorative box with twenty beautiful note cards in two design variations and twenty coordinating envelopes. The gold foil accents offer a special and refined touch of style. Josephine Kimberling Julie Phone Wallet Dream Catcher features an interior compartment for your phone, multi card slots, and a cash sleeve. Close it securely with the fold-over flap and snap closure. It’s great for carrying in your purse, or simply attach the wristlet strap for a great compact alternative to your traditional handbag. Medium Spiral Journal Paintbox Floral this beautifully detailed spiral journal features 122 interior pages with assorted designs and a fully printed front cover with gold leafing. The gold spiral binding offers refined designs aesthetic, yet makes the journal easy to write in. Josephine Kimberling Abigail Train Case Nature Trail features a beautifully printed design with classic accents of Vegan Leather and gold hardware. The top zippered compartment features a large zippered mesh pocket and convenient brush holder, while the main zippered compartment offers plenty of storage for larger items and elastic pockets for securing smaller items. My Opinion: I really like everything I got Capri Designs does a great job at detailing and making everything look pretty. The note cards I will use to sent a letter to a friend or family member. The phone wallet will go right in my purse and when I do not want to carry my purse in my hand to carry. The Train case is great for vacations and the journal to write down my next story in life.